The logo, front, rear and insides of my Indy. 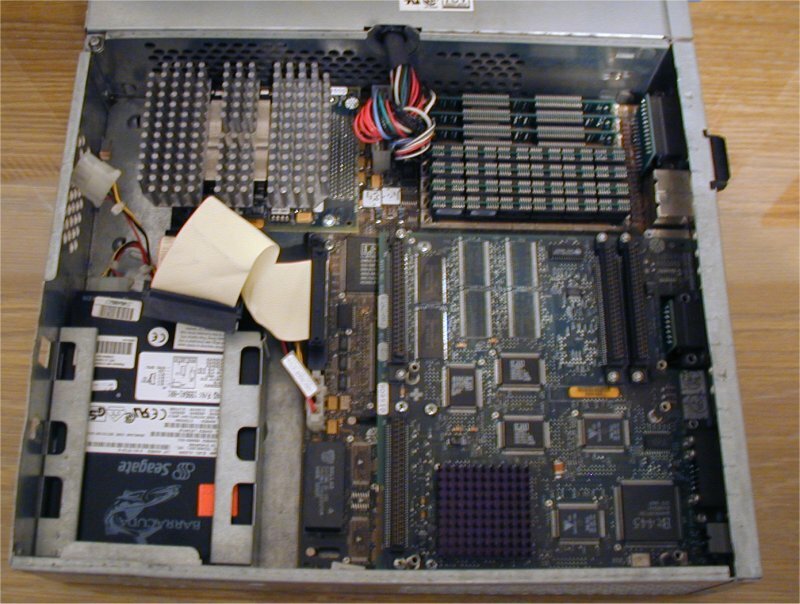 The Indy was introduced in 1993 as a low-cost high-power UNIX graphics workstation. This is a machine I've lusted after ever since I first saw it, all that MIPS power! The original Indy was marketed for $5000. I picked mine up for $80 on eBay a couple of years back. You can find 'em cheaper now. My Indy is a 200mHz R4400 with a 24bit XL Newport graphics card. I run IRIX 5.3 on it. The Indy comes stacked with all sorts of ports on the back. 3D goggles, 13W3 video out, AUI, PS/2 mouse, Serial port 1, parallel port. Headphones, Mic, Audio in, Audio out, Audio something, Composite in, SVideo in, IndyCam in, ISDN (Covered with white sticker with the red arrow), 10bT, PS/2 keyboard, Serial port 2, external SCSI2.